Can you spot our clouded leopards? It can be tricky – they’re shy, nocturnal and excellently camouflaged! Here’s a tip: Try looking up. Clouded leopards are fantastic climbers. 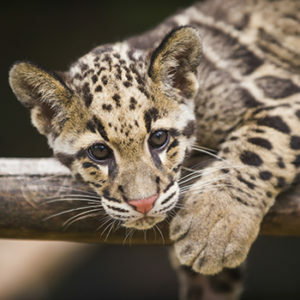 Clouded leopards live in tropical forests, grasslands, scrub and mangrove swamps in Nepal, Sikkim, southern China, Sumatra, Thailand and Borneo. Find them in the Asian Forest Sanctuary. Our elephant keepers also look after the clouded leopards. They give a talk each day at 1 pm – bring all your questions! 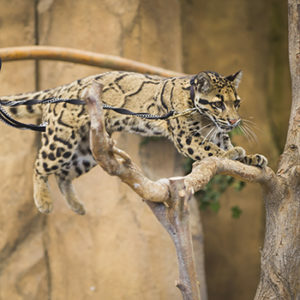 You might also spot one of our clouded leopards in a Wild Wonders animal show. Orchid and Banyan are sister and brother, born here at the Zoo in 2015. They live together and get along really well. 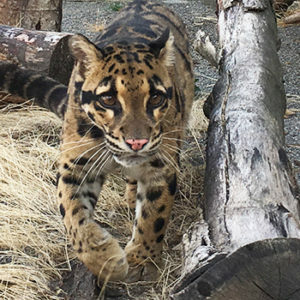 Orchid is smaller and a little shyer, says senior staff biologist Maureen O’Keefe, but when she walks onto the Wild Wonders stage you would never know – she’s a pro at the climbing, balancing and leaping that show off a clouded leopard’s natural wild abilities. Orchid is great at a couple of other behaviors, say staff, like coming when her bell is rung or sitting with all four feet on a perch to allow keepers to put a leash on her for the show. But one of her favorite places is up high on the highest platform in her outdoor yard – around 12 feet high – to survey her territory. Banyan and Orchid are brother and sister, born here at the Zoo in 2015. They live together and get along really well. Banyan is around 20 pounds heavier than his sister, and is super-talkative, says senior staff biologist Maureen O’Keefe. “He chuffs and whines a lot as we come by,” she says. Since he was hand-raised, he also loves getting scratched behind his ears – a cat favorite. 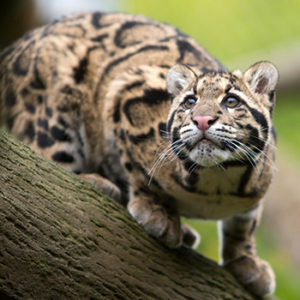 Like Orchid, Banyan is great at the climbing, balancing and leaping he does in the Wild Wonders show that display a clouded leopard’s natural wild abilities. He’s also good at allowing staff to take a blood sample – really important for keeping animals healthy. Banyan loves eating fruit whole for an enrichment treat, and is just a little goofy, says staff biologist Jessie Sutherland. But basically, says O’Keefe, he’s just a big sweetheart. Tien was born here at the Zoo on May 1, 2013. Because he was hand-raised here, he’s really confident with our keepers, chuffing and “talking” with them whenever he sees them. Jao Ying was born May 30, 2007. She really likes playing with greenery, especially bamboo, says senior staff biologist Shannon Smith. “She carries green stuff from the outdoor habitat back to her resting room and decorates it,” says Smith. Nah Fun was born July 15, 2009, and he’s unusually gentle – for a cat. Like the other male clouded leopards in the Asian Forest Sanctuary, Nah Fun likes hanging out by the beam-like log (the girls prefer being near the tree). Sang Dao was born on May 22, 2015 – one of the youngest of our clouded leopards. At around 33 pounds she’s also the smallest – and quite a character, says staff biologist Andy Goldfarb. Her climbing ability is also pretty unusual, says Smith. All clouded leopards are excellent at this skill, using their long tail for balance and even hanging upside down. But Sang Dao can do it even when there seemingly aren’t any handholds – like an indoor skylight. Chee Wit was born Feb. 14, 2010 – a Valentine’s Day baby! At around 61 pounds he’s the largest of the clouded leopards, and (unusually) doesn’t like the favorite treats of whipped cream or ice cream. Instead, he just loves his meat. And he also loves his plastic boomer ball, say staff, playing with it all over his habitat when he gets it. Chai Li was born July 12, 2009, and is a “very quiet kitty,” according to senior staff biologist Shannon Smith. She is very shy around people she doesn’t know, so usually stays indoors during the day and goes out into the habitat after all Zoo visitors have left. But like all the clouded leopards, she loves keeper Andy Goldfarb. 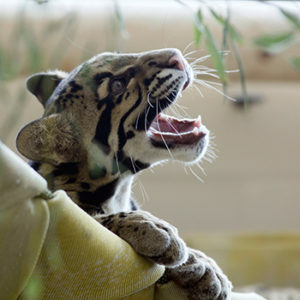 Clouded leopards are carnivores. They hunt monkeys, small deer, wild pigs, birds and rodents; also domestic calves, pigs, goats and poultry. Their predators are mainly humans, hunting them for their pelts and to protect livestock; and by tigers. In the wild, clouded leopards breed year-round. After a three-month gestation period, females give birth, usually in hollow trees, to litters of 1-5 cubs. Cubs are born blind. They open their eyes after 10-12 days and by six weeks are climbing trees. They stay with their mothers for about 10 months, learning how to hunt. 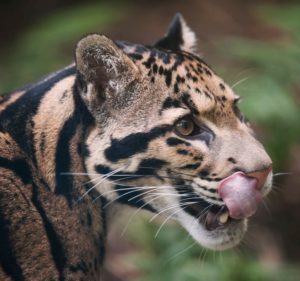 Mostly solitary, clouded leopards hunt at night, They stalk their prey from the trees or ground and are rarely seen by people. They can climb upside down, hang from branches with their hind feet and even climb down trees headfirst like a squirrel! 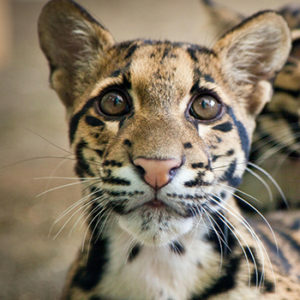 THE THREAT: Clouded leopards are endangered. Their tropical forests are being cut down at the world’s fastest deforestation rate (around 1.2% yearly) for logging, human habitat and to grow palm oil, a common food product. TAKE ACTION: Check products you use for sustainable palm oil, and encourage companies to make the switch. Send a letter, email or tweet, and download a Palm Oil Shopping App. 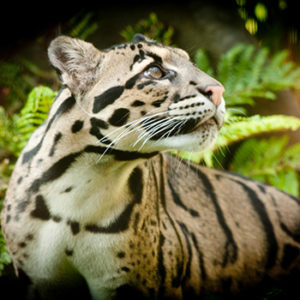 Visiting our clouded leopards? Then you’re super-close to our Asian elephants! Meet these amazing giants and chat with their keepers at daily presentations.